Come and see our Garden Centre today! Our clean five hectar garden centre supplies only the healthiest and most uniform plant material, true to species & variety. 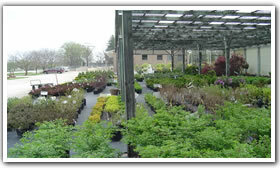 Our selection is tremendous with over one thousand different varieties of trees, shrubs, perennials, vines & ornamental grasses. We supply everything you need to get the plants off to a great start from topsoil, additives, mulch and edger to decorative boulders, grass seed & stepping stones. Talk to our trained and knowledgeable Nursery staff about your plant concerns today!